A lone pine tree that stood as a symbol of hope in Japan, after surviving the huge tsunami that swept away a forest of 70,000, was being cut down on Wednesday in a bid to preserve it. 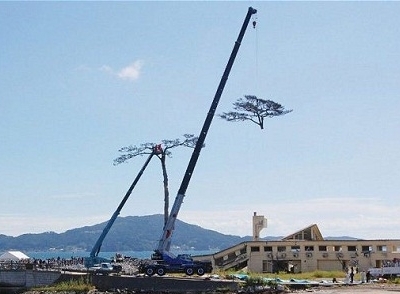 The tree, which came to be known as the "miracle pine", will be sliced into pieces and treated before being put back together, in a process expected to cost about 150 million yen (£1.2 million). A ritual reflecting the beliefs of Shintoism, Japan's animistic native religion, was carried out on the pine before the delicate process began on the shore at Rikuzentakata, a city badly hit by the March 2011 disaster.